We are Chameleon Girls the Mom and Daughter craft fighting team. Together we tackle sewing, cooking and crafts. House Warming Gift for a Librarian??? What do you'll need to make lamp? 1. Glue the wooden feet to the base. We used a wooden plack from Michaels. We did not need to sand (insert smile). 2. Paint the base and feet brown. Mix black paint with water to make runny. You do not need to make much. Paint base & feet black wipe with damp cloth. This will give you an old weathered look. Yep that's the color we want. 3. Stack books to see how many you will need. 4. Measure center of base and books with ruler and pencil. 5. Drill base and each book. You will want to grab an old telephone book for this, so you don't drill a hole into your table. 6. Slid your thread rod through the hole. Screw on the nuts and tighten against the washer. For stability, it is best to start with the largest book. Play around with the books to see that you like the combination. Take a picture so you will remember what your stack of books look like. BTW- do not use plain glue, use Epoxy Glue!!! We used Gorilla glue- bad, bad, bad! It dries yellow and fluffy, not clear. 7. Smash, Smash, Smash the books!!!! It will seem like the books are bubbled, but keep at it. 8. Slide a washer and nuts on top of last book and screw down tightly. With all your weight you will need to squish the books as you tighten the screw. I do mean ALL OF YOUR WEIGHT! I was on the books with my knees. Did I mention SMASH the books down? 9. Now that the books are nice and tight- Mod Podge the book pages. 10. Follow the directions on the lamp kit. Did I mention the room-mate works at a Coffee House? to see other craft battles we have won. What a cool lamp! Thanks for the great tutorial. 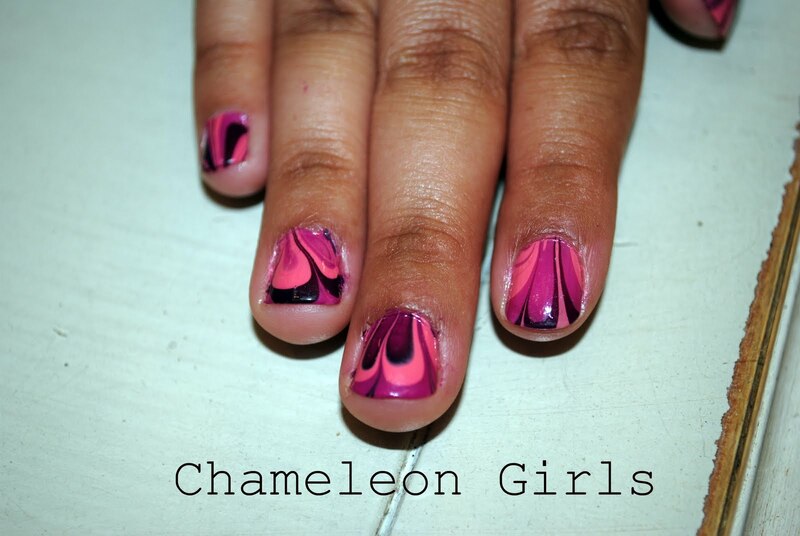 Love the marbled fingernails, too! Y'all make a fun pair! Why do you need to glue the books down?